The Whale Shark is the world’s largest fish [makes a sturgeon look like a minnow] and can commonly be found in the waters of the Gulf Of Mexico near Isla Holbox during the months of June to August. Many years ago the summer migration of feeding Whale Sharks “Tiburon Ballena” was discovered off the coast not far from Holbox. What started as a small cottage industry has blossomed into the main tourism generator for Isla Holbox every May 15 to Sept 15th. Whale Sharks or Dominoes as the locals call them, are the oceans largest fish. Measuring up to 30 ft in length there harmless vegetarians allow full interaction with snorkelers on a daily basis. If you are planning a visit to Holbox during the summer months you don’t want to miss them! Make reservations in advance to avoid disappointment. The Whale Shark Tourism infusion started with 9000 people in 2005 swimming with the Dominoes. 2006 saw a 50% increase to 13,500. 2007 saw another increase to over 16,000 and in 2008 the total board saw almost 20,000 Whale Shark swimmers! 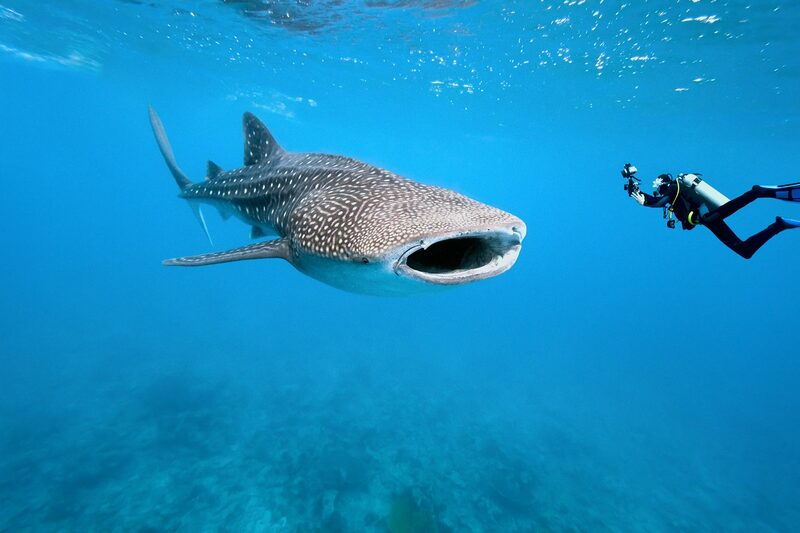 There are experienced scuba divers who have done everything in the water except swimming with a Whale Shark. They come from Cozumel before or after doing their deep sea diving. Last year in July, over 200 Scientists from around the world descended on Holbox for the 2nd Annual Whale Shark Conference. They came from four continents and were amazed by the huge numbers of Whale Sharks around Holbox. Families come on Day Trips from Cancun every day as well. Kids as young as five years old are allowed to swim with the Whale Sharks. Others come for Private “VIP” tours on High Line Speedboats. The Whale Sharks have put Holbox on the map! There are a variety of outfitters who are licensed to take swimmers out to swim with the Whale Sharks. There are Non English speaking fishermen who have smaller less comfortable boats with smaller motors all the way up to top-shelf luxurious American style tours with all the bells and whistles. There is one outfit “Cancun Whale Shark Tours” who Specialize in All-Inclusive packages including full transportation from Cancun and the Mayan Riviera.